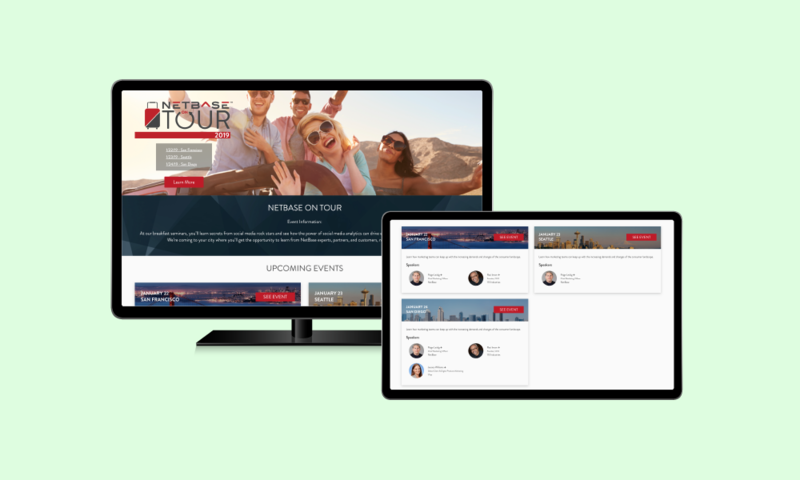 The company required a website for their 2nd annual roadshow event that needs to display all the speakers information and cities they are visiting. The page need to be built fast and flexible enough for members of the marketing team to make changes to without heavily involving a developer. I built NetBase On Tour 2018 using WordPress and Divi theme. The visual builder gave easy access to layout components and made use of the framework that the company is using. At the cost of dymanic content for speed and flexiblity, the content were coded in static blocks, which means when a session title have changed, we will need to manually update the places that are mentioned. As the design was finalized for 2019, I recreated the front-end using Gatsby, React, and leveraged Airtable CMS as the back-end. Airtable CMS offered a "Google Sheets" experience, which everyone on the team is familar with, and the flexibility to allow us to define a schema that works well for us. This project now have a back-end that holds all the content, a static site generator that builds the site, and a Jenkin webhook that will rebuild and deploy the site when a change have been made. By recreating this website with Gatsby and Airtable CMS, I was able to increase the workflow efficiency and the loading speed of the site.